We hope that music will always have tribes of people keeping esoteric traditions alive – your Renaissance musical ensemble, your Slovenian folk instrumentalists. It just happens that electronic technologies have attracted their own followings, cultivating knowledge of Texas Instruments chips found in specific arcade games the way some people might maintain a balalaika. Chip singers have never gotten the kind of attention synthesizers have. But if Moog – and the synth itself – can look to Keith Emerson’s “Lucky Man,” fans of robotic sung vocals will always have Humanoid. Coinciding with the release of Chipspeech from Montreal developer Plogue, the free “chipspeech AUTOMATE SONGS .01” compilation on Toy Company is a cross-section of compulsive chip artists from around the world. Toy Company, the chip-focused label based in Montreal (with some strong New York connections), has been a lone stalwart of music made with vintage synthesis tech. The “chip” loosely refers to ICs – integrated circuits. These are what came after the first synthesizers; they’re the mass-produced analog and digital soul of a generation of electronic sounds. Real chip music isn’t just a nostalgic, ironic hipster production by people who miss afternoons playing NES. No, that doesn’t begin to explain the level of obsession that drives these musicians. We’re talking people who can tell the difference between an emulation and original chips, who know the model number of particular TI devices that went with specific consoles, and who coax sound out of this gear in the way a concert master might drive a string section. In particular, I want to pull out some music you might otherwise miss on the compilation, partly because several go far from the sort of tracks you likely expect. Jonathan Adams Leonard has turned these singers into haunting oratorio. Remember, these chips didn’t originally sing in tune; they’ve been retrained in software form. Here, they blend with strings and organs to become themselves organlike. The simple writing is majestic; glissandi are oddly chilling. I spoke to Toy Company co-founder Francis Yoan Rodrig – aka XC3N – to walk us lay people through what’s here. (And yes, I’m in this bunch, too, because I couldn’t resist submitting something once I was on the chipspeech beta.) Plogue’s David Viens chimes in on a couple of tracks, as well. Francis: To give a bit of background about Toy Company: it started in 2007 and has been maintained by XC3N [Francis], Aliceffekt (featured on the compilation as Villa Moirai) and Pocaille. While the main purpose is to curate lo-fi music parties in Montreal, we started releasing yearly compilations featuring like-minded artists willing to showcase their music and help us finance our activities (paying for transport, booking venues, etc). The collective have grown to be an odd collection of talented independent music makers, a grassroots approach to elusive DIY electronic music. We were really excited when Plogue asked us to host the Chipspeech compilation. They have been a long term partner of Toy Company and we hold their software in high esteem! I’ve been relying on it whenever working in Renoise [tracker] and Pocaille uses it in mostly all his productions. In retrospect, we think it’s a good idea: now the whole project his centered around our native Montreal and most of the collective’s hard workers are featured. [Track the first] First, it’s hard to miss HUMANOID’s contribution! What an incredible chance to have legendary FSOL’s half on our humble label! The compilation has a wide array of ecclectic tracks, ranging from opera-esque experiments to a capella songs to digital dub and, as expected, banging techno tracks. 03: Ed Ten Eyck has done sound desing and preset work for many plugins, and surprised us with this cool track! He gave us a Moroder-inspired dancy track (with a hefty dose of chipsounds bleeps) that features many different chipspeech solo timbres – from monotonous to highly expressive – on top of some lush choir pad sounds. 4: From local movie and video game soundtrack prodigy Wasreich comes this really fresh “STAKKER humanoid” re-interpretation. This track was used in the OTTO MOZER announcement teaser trailer, and with good reasons! 5: Ubiktune Netlabel’s own C-jeff brings us his signature jazzy funk complete with Chipspeech Doo-wop in this sparkly jam featuring a mean guitar solo by Raz Ben Ari. 6: Toy Company’s Pocaille’s retro-fueled Grove Synthwave will make you travel through the sheer fabric of time and space itself, hurling your very soul through multiple dimensions as you then realize that the future is not now anymore, it’s over. 7: CUCKOO has a skwee-like cheerful track showing just how expressive Chipspeech can be, it’s time to wake up! 8: Strayboom’s Vincenzo shows us just how efficient it is to make a convincing lead singer out of Chipspeech with this dance-floor ready chiptune track. 10: Plogue’s Phonetics Wizard MadBrain is working miracles with this 100% Chipspeech acapella song. In French. Mastery at work! 11: One of the most mysterious figure in modern electronic music, Devine Lu Linvega incarnates Villa Moirai and demonstrates the virtues of Chipspeech as an instrument in this atmospheric yet rhytmic soundscape. 14 : Give Me Patience also restricted himself to the Plogue ‘Chip’ suite, resulting in a strangely soothing dreamy and atmospheric jungle track. 15: MadBrain’s second track is a surprisingly uplifting pop song featuring a vocal duo testament to the many contexts in which Chipspeech feels right at home. 16: Torley’s second submission is a marvelous opera piece done entirely in Chipspeech. Quite wonderful and highly recommended. 17: An homage to Montreal’s amazing Fade Runner, this digital dub track is done entirely with Plogue plug-ins and considers 6502 assembly language tutorials poetic enough to be considered lyrical content. 18: Scott AKA AbstractCats, also has done presets packs for tons of plugins, so was an ideal cadidate for beta testing. His track features the grinding side of chipspeech with some nifty modulation going on. the way it incorporates a solid groove layered with an echo-drenched atmospheric top is quite a feat in itself. 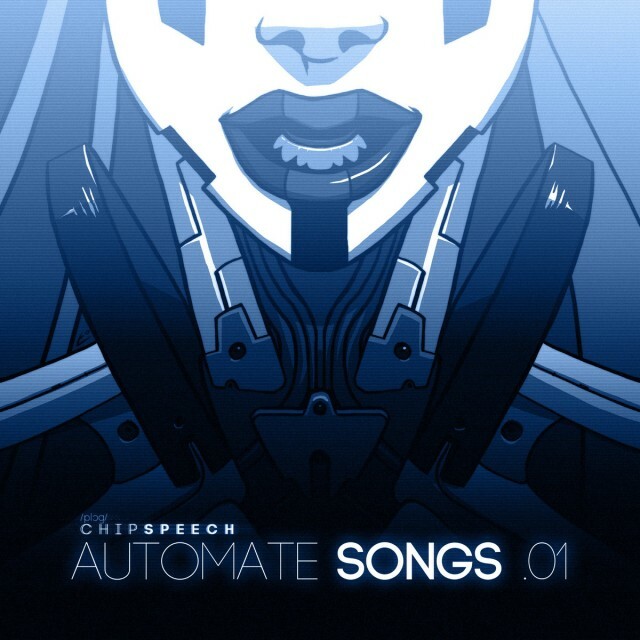 19: Our last track is a rock opera-inspired epic and poetic journey through Chipspeech’s every voice engines. And yes, of course, there’s my own track, which I suppose I should explain. It’s a kind of ode to unintelligibility, by using Shannon Weaver’s theoretical texts that explain the problem of communicating (applicable not only to digital encoding, but all forms of information).